I have always been fascinated by the stars. When I was young, it was the mythology that captured my imagination, and only as an adult, the science. For now, this is a growing list of stargazing-related articles. 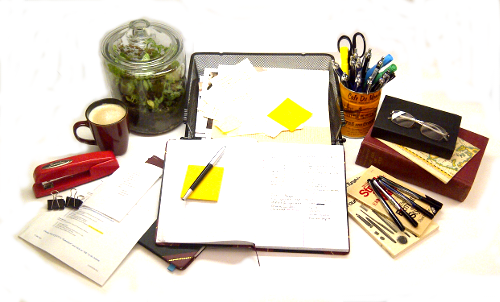 I am certain that some logical organization will eventually emerge. When I saw Star Wars: The Force Awakens a few weeks after it hit the theaters, I immediately started writing a post about what I liked and didn’t like about the film. The more I read other’s reviews, however, the more I realized that my post lacked substance, so I put off publishing it until eventually it died an editorial death. I continued to share my observations with friends and colleagues, of course, and one topic kept coming up: what in the galaxy happened between Han Solo and Princess Leia? Individually, the characters in this film were much less interesting than their younger renditions. Han went from cocky cowboy to cranky old man. This isn’t an unrealistic transition, I suppose, but it didn’t add anything of value to what I considered to be a flat performance by Ford. I only recall seeing two faint traces of the young smuggler during the whole film. The first is when Han and Chewbacca board the Millennium Falcon, and he utters the line made famous by the second teaser trailer, “Chewy, we’re home.” The second was when the idea came to him to throw the captured Captain Phasma into a space-station-grade trash compactor, a nod to his own experience on the original Death Star. Save for those two moments, if someone wanted evidence that Ford desperately wanted out of the Star Wars franchise, this film is it. I guess I can’t blame him too much. No actor likes to be typecast, and honestly, how many movies can you make about blowing up a big round gun floating around in space? Fisher’s performance was worse. No longer the saucy, headstrong princess, Leia has been converted into a dried-up political and military leader…and a bitter one at that! Her expressions could be summed up as a collage of sadness, regret, and disappointment. To top it off, she has one of the worst lines in the movie, something to the tune of, “Luke is a Jedi, but you are his father…of course he’ll listen to you.” That’s what she said, but I can’t shake the notion that what went through her head was more like, “I’m setting you up, you smug, no-good, son-of-a-bantha. I’ll teach you to leave me in the middle of a family crisis. Sure, Ben will listen…right before he starts severing your appendages.” Maybe it was how she said it, or maybe it was her apparent lack of grief when she sensed (via the Force) that Han had died. “Well, you had it coming” was written all over her face. I’m probably alone in this theory. Everyone else is too busy talking about how Fisher hasn’t aged well, and she’s too busy complaining about age discrimination in the film industry. The fact that Han and Leia are not still together in TFA is (IMHO) problematic in a number of ways. Let’s start with basic storytelling. Through the original trilogy, we watch these characters grow, not just as individuals, but as a couple. At the end of New Hope, Han has collected his reward for saving the princess, and is ready to blast off to the next adventure. After Luke’s chastisement, Han has a change of heart and helps secure the destruction of the Death Star. Leia’s smile at the award ceremony punctuates her approval, and she doesn’t seem to mind the wink and the goofy grin she receives from Han. 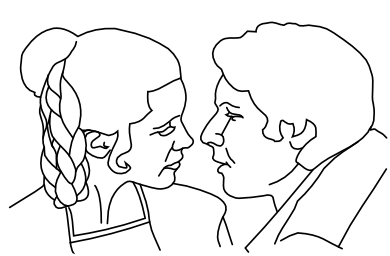 In the beginning scenes of Empire, the romantic tension between Han and Leia has obviously escalated. Like it or not, they are in a relationship. By the end of the movie, they deliver the famous “I love you/I know” lines just as Han is being frozen in carbonite. The “He’s my brother” scene at the end of ROTJ seals the deal. Han is a completely different person from the young smuggler we met at Mos Eisley, and Leia found herself truly capable of trusting someone else with her heart. They were cast into a classic love story in which they — as far as we ever knew — lived happily ever after. Much has been written about Star Wars belonging to the genre of myth, and this ending is exactly what we expect. So, they’re still together, right? Wrong. Eventually, the honeymoon ended and they now have a son who apparently has had a few issues growing up. Now, I’m not going to speculate at this point about what happens between Ben and his parents, and how his uncle Luke may be a catalyst, but we do know that when things get tough, Ben turns to the Dark Side and Han heads for the hills (or whatever the space equivalent would be). That’s where TFA picks up, with Han and Chewy running a salvage business and Leia choosing to escape the pain of life by concentrating solely on her career. When their paths cross on the planet Takodana, it is clear that they really have chosen to go their separate ways and that they have little more to say to one another. He knows he did something wrong, but is too prideful to apologize. She’s too callous to care. Ben is the only thread that binds them at all. Following the rules of classic storytelling, it is not supposed to turn out like this. All of that buildup of plot and characterization in the first trilogy has been completely wasted! So why the change of direction? I suspect it was for the same reason movies and television shows in general have changed so drastically in the last thirty years: a shift in modern culture. The myth is out of style. Family sitcoms poke fun at dysfunction instead of reinforcing family values. Society demands realism over mystery. The highly-popular CBS police drama CSI premiered in October 2000, a little over a year after the Force had to be explained in biological terms (i.e. Midi-chlorians) in Phantom Menace. Perhaps the writers of TFA felt that Star Wars fans needed another big dose of reality, and decided to blame the Solos’ broken home for Ben’s conversion to the Dark Side. Doing so not only complicated the story unnecessarily, it cheapened the plot as well. What source of pure evil could possibly have torn Ben away from a strong, loving family? Who cares? That’s not worth exploring. It’s far easier to blame it on the young man’s primary male model: pitiful good-for-nothing ol’ Dad. Killing the fairytale ending was a small sacrifice to make for yet another opportunity — for Disney, mind you — to tell millions of impressionable youth that the only real myth here is true love, and that the family unit is not a viable building block of society after all (despite eons of empirical evidence to the contrary). Indeed, this film is highly reflective of today’s popular culture. Mentioning all of this in conversation usually evokes responses ranging from eye-rolling — as if I had just ventured off on some idealistic crusade — to outright argument. The latter is more likely to occur if the other person’s real-life circumstances closely align him or her with either Han or Leia. This supports my opinion that spinning the story in this direction is not only hurtful to those who are trying to heal from such wounds, but it also desensitizes society, inviting it to accept the failure of the family unit as normal. I’m not a screenwriter, so no, I probably couldn’t write the thing, but if it were up to me, the plot would’ve taken a completely different direction. Having evaded their First Order pursuers, Rey and Finn could’ve been delivered to a safe haven within the New Republic, perhaps through the intervention of BB-8, a next-generation astromech programmed with a mission to fulfill. There they would meet Han and Leia, still together and retired, who only desire the return of their son to the side of good (and perhaps to find Luke in the process). At their home, which I envision being an Arts & Crafts style structure nestled in the woods of a planet resembling Endor’s Moon, Han could deliver one of his best lines, “It’s true. All of it.” Taking this path would spare us from both the Rathtar incident and the visit to Maz Kanata’s Castle (neither of which I found to be essential to the plot), and still provide ample opportunity for Rey to discover her Force powers and face Kylo Ren in a lightsaber duel. Han could even volunteer to aid the Resistance in blowing up the latest gun-planet (if we must go there at all) in the hope of finding and saving Ben, thereby adding sincerity to Leia’s words (cited above) and genuineness to her anguish upon sensing Han’s death. And yes, I have no problem with Han’s death scene, but the campy psychobabble dialogue would absolutely have to go. As a Star Wars fan, I must accept all of this as canon. It’s the official story, for better or worse. That doesn’t mean I have to let it sway me to accept the modern view of society and its devaluation of a morality held sacred by previous generations. Nor does it require that I believe the decisions made as the story continues to be told are the best possible. Quite the opposite, I think Disney missed out on a gold mine of opportunity to create a rich narrative. Nonetheless, it is what it is, and as a fan I look forward to the next installment. Poetry is important. By writing it, we master language. By reading it, we aid memory. Through it, we are taught history, religion and lore. Without it, words could not marry music. And only hypocrites mock it, for no man alive is immune from its influence.